Sometimes you pick up a book and you have zero idea what it’s about. That’s what happened to me with this book. When this book came up for review, I got the pitch at the same time as I got the pitch for The Pearl Sister. For some reason, my brain combined the two books and I said yes to both of them. The title of this book sounded romantic and like it would be in the same vein as The Pearl Sister so why not read that one too. Then The Storm King book arrived in my mailbox and I vaguely remembered agreeing to read it, having already read and reviewed The Pearl Sister though, I was literally scratching my head wondering what this book was in fact about. I didn’t even bother to read the description and blurb before I started it since it was close to Valentine’s Day and I felt like ‘a blind date with a book’ was a nice way to celebrate Valentines Day. So I went into this one completely blind. Nate McHale has assembled the kind of life most people would envy. After a tumultuous youth marked by his inexplicable survival of a devastating tragedy, Nate left his Adirondack hometown of Greystone Lake and never looked back. Fourteen years later, he’s become a respected New York City surgeon, devoted husband, and loving father. Then a body is discovered deep in the forests that surround Greystone Lake. This disturbing news finally draws Nate home. While navigating a tense landscape of secrets and suspicion, resentments and guilt, Nate reconnects with estranged friends and old enemies, and encounters strangers who seem to know impossible things about him. Haunting every moment is the Lake’s sinister history and the memory of wild, beautiful Lucy Bennett, with whom Nate is forever linked by shattering loss and youthful passion. As a massive hurricane bears down on the Northeast, the air becomes electric, the clouds grow dark, and escalating acts of violence echo events from Nate’s own past. Without a doubt, a reckoning is coming–one that will lay bare the lies that lifelong friends have told themselves and unleash a vengeance that may consume them all (summary from Goodreads). This book was clearly NOTHING like The Pearl Sister nor was it a romantic novel or magical realism book, that the title seemed to suggest to me for some reason. This book is a thriller in every sense of the word for me. It was suspenseful mystery and had some crime fiction elements, but for me it was a thriller. I know other reviewers might not agree–others put it in suspense or mystery and firmly NOT a thriller–but I went with thriller. It’s hard to explain why, because it wasn’t a fast paced novel. In fact, the mystery was a slow burn and it also had a bit of a coming of age story in the plot. But as the story and mystery built, I was eager to keep reading and devoured as much as I could in one night–especially the last 100 pages or so. Perhaps the build up and multiple layers in the plot helped propel me forward in the story, and become more invested in the plot, making it feel like a thriller even if it wasn’t meant to be called a thriller. Not sure but when I thought about where I might place this book….thriller was the first genre that came to mind. The coming of age plot line added a lot to the narrative for me. I found it interesting and made the plot relatable and meaningful for readers. This book wasn’t a ‘run of the mill’ story which I think a lot of reviewers had a hard time categorizing it and articulating where it should be. It is not a formula driven plot but yet it has hints of traditional crime fiction novels…..with an edge. I loved his style so much. It was refreshing and interesting. 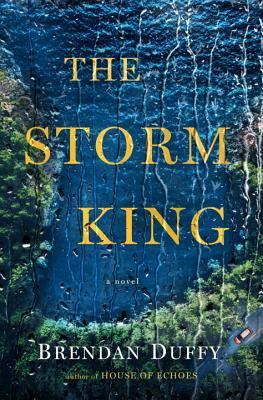 Duffy is a new author to me and I was impressed with this prose style and the complexity of his story. I haven’t read a ton of thrillers or books by greats like Harlan Coben (it’s suggested that fans of Coben will like this book) so I really have no one to compare this author to. I enjoyed how concise the writing was and how multilayers the plot and characters were. After finishing this book, I was so happy I went into it essentially blind. The novel was a mystery to me as was the plot and I loved going into this book blind. Had I remembered what it was about or read the summary first, I might not have enjoyed it so much. I was surprising and thrilling in a different way than I normally read books which heightened my sense of the novel itself. While this was not the book I was expecting to read, it was a book that was more than a delight to read.